Most of you are probably aware that I rather enjoy being out in nature with my sketchbook and a Danish pastry (that’s a cake, of course, not a Scandinavian model). 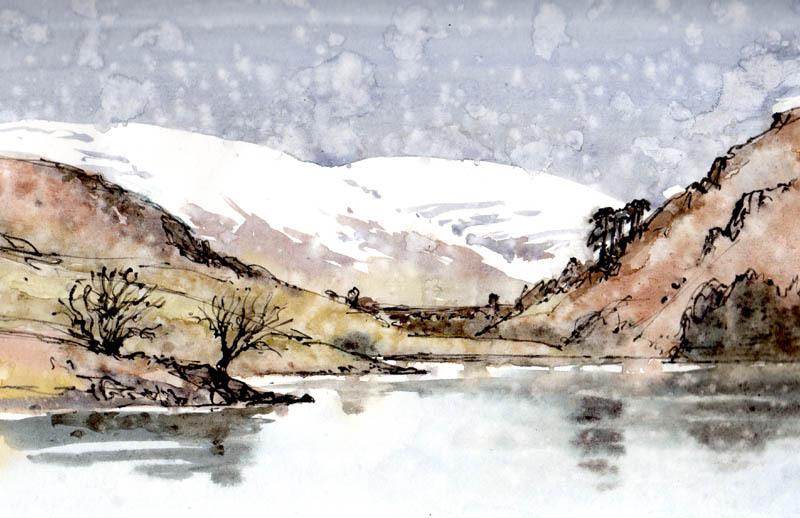 I always try to plan my excursions to coincide with the optimum conditions for my objectives, so last weekend I decided to go over to the Mid-Wales Fjordenland to sketch the snow-covered hills and filled-up reservoirs. This is an area more commonly known as the Elan Valley, a sort of Welsh lake district. With all the rain we have experienced in December and early January I hope to see scenes I have not witnessed for many years: the reservoirs so full that those hideous margins between the landscape and water are covered over. Sure enough, the reservoirs looked stunning, even without the help of the sun, with Garreg-ddu reservoir (on the right) looking especially magnificent. So, it pays to choose your moment, in this case after heavy rains when the water is high in rivers, lakes and reservoirs and waterfalls are really at their best. Leave it for the hot days of summer and you are quite likely to encounter just a trickle of a waterfall! I didn’t get an opportunity to sketch this scene as the light was fading and I was parked in an awkward spot, so I might return soon on a better day and render it in watercolour. I did, however, spend some time sketching other subjects, one of which was done in watercolour. As I began the sketch it started to rain, and kept raining until I put it away and then it stopped. That is pretty much par for the course! Much of the intensity of the colours has washed off, but the black watercolour pencil has kept the image intact. I did this from a rough patch of ground mainly covered in dead bracken. There was no path and the charm of these places from the artists’ point of view is that the awkward approach inhibits most other people from coming over to see what you are up to. An advantage of days like this is that if you wear a large hood it isolates you from the voyeurs and can impart a sort of mysterious non-gender type of person to others – a great advantage! 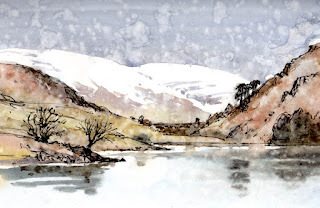 This entry was posted in aerial recession in landscape paintings, atmosphere, David Bellamy, sketching, sketching outdoors, Watercolor sketching watercolour-pencils, Winter landscapes in watercolour by David Bellamy. Bookmark the permalink. Thanks for the memory David, I have visited Elan on and off all my life. unfortunately I now live in East Anglia, so visits are few and far between. That looks like a place you could go to daily and always finding something new to draw. Simply beautiful. Love reading your posts. Thanks for sharing. Would like to see your version of Lake Talyllyn, ( near Aberdovey and the Tallyllyn railway) I have had several tries (most of them wet !! ) but the Talyllin hotel next to the end of the lake provides an excellent watering hole and in fact a decent view for a sketch or two from indoors ( well thats my excuse ). 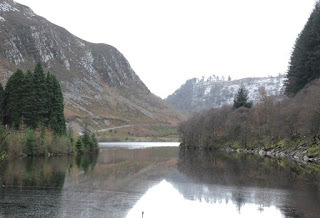 Garreg-ddu looks most tempting though and would love to see both your and Jennys versions in watercolour and pastel. That would be really nice to see, if you can find it. We have had quite a few holidays in the area over the years as I was introduced to the Talyllyn narrow gauge railway by a friend who was a supporter, from there we then discovered the Dolgoch Falls and all the other marvelous views in the area. Thank you for the books you have both produced, they are inspiring. Living in Oz, (Australia not the myhtical land, although some of the scenery is pretty amazing), i wait with anticipation for your detailed accounts in your webpage and the little visual snippets that accompany them, Such beautiful renderings are always a breath of fresh air, especially in our sticky summers. Love the picture David, as always your work is outstanding and my wife and I treasure the painting we purchased at Windrush last year. Really liked this – reminded me of a day out walking in the foothills of Beinn a’Ghlo near Blair Atholl when I sat down to paint a sketch of the hills – I called it rain assisted painting – but fifteen years on you can’t even see the rain spots – so get out there and enjoy! Bonus was it was a mild winter and because I was sitting still I was lucky enough to see a mountain hare in full white coat against the heather and bracken – only the snow was missing! Hi David, yes I remember rain we had some once earlier in the year,forget that I know it doesn’t always rain in England I was born in Surrey. Love to see your work and exploits, and still hoping to catch up with one of your tours some time, always liked your work and humor and have some DVD’s too. best wishes, Derek Newton, Wanneroo Western Australia.